"Yeah, as for directions....just look for the guy with the giant alien orb in his yard....we're the next house...."
sic dome—a mini Epcot in the sky. And that’s how the 02 Sustainability Treehouse looks suspended 45 feet up a poplar tree in the front yard of the Pewaukee, Wisconsin, house in which it was built. 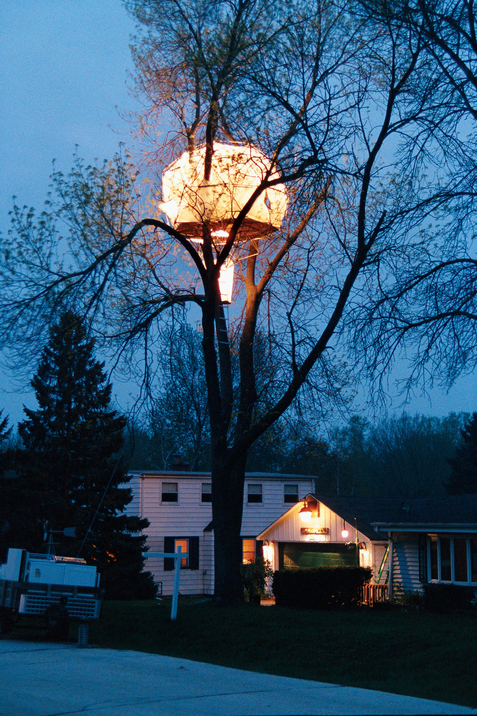 At the base of the tree is a basket constructed of polypropylene panels connected to an electric winch, which is tied to the roof of the tree house. As though in an elevator, occupants ascend the tree and enter superhero-style through a triangular door on the floor. Here, the real fun begins. The entire structure is clad in translucent 16th-inch triangulated polypropylene panels, half of which open to allow breezes to waft in on warm summer nights. “In daytime, the light filters in and it has a really soft quality, like a pillow room,” explains Feider. The standard model 02 Sustainability Treehouse is 13 feet wide and costs $18,800, which includes three weeks’ installation labor. A do-it-yourself kit is about half that price. All materials are 100 percent recycled or recyclable, and interiors and sizes can be customized per client specifications.